Corner By Corner Landscapes has two different pond styles to choose from. We will try to give you information to help make your decision easier. A professional pond should be no smaller than 11'x16'. The size will help minimize time spent maintaining your pond. The larger the water volume the more stable the pond ecosystem will be. Garden ponds and koi ponds are two totally different systems and many people have different opinions on which system is better. Please note that all ponds require time invested into them. We would like to think of it as the best hobby we have tried. 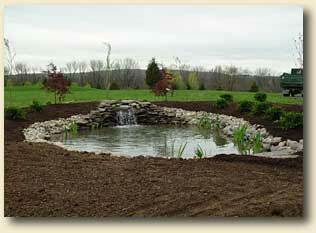 It's important to remember that all of our ponds are custom designed. 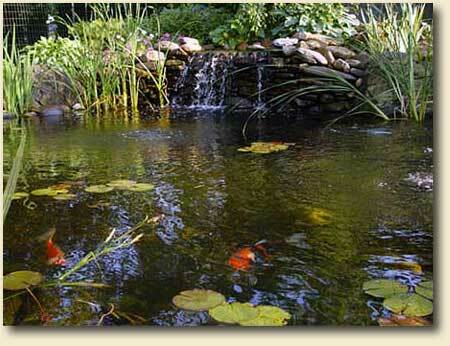 We can borrow techniques from both filtration concepts.We feel that both ponds are great in their own way. The garden pond is natural and if you feel that creating Mother Nature would be challenging for you then it would be a great choice. If you are the type of customer that wants large fish that can grow to three foot in a well-maintained pond then a koi pond would be better. 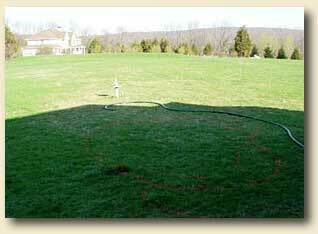 You will need to hire an electrical contractor to run service to the pond after we install it.